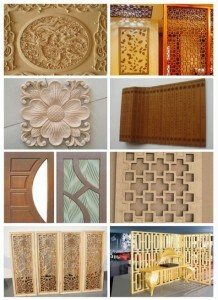 One machine that I has always supplemented business revenues, or has been the main focus, is the CNC router. If you’re completely new to this, a CNC router (or Computer Numerical Control router) is a computer-controlled cutting machine used for cutting various hard materials, such as wood, composites, aluminum, steel, plastics, and foams. A CNC router typically produces consistent and high-quality work and improves factory productivity. You or a customer creates some sort of graphic on a computer, like a custom sign, and then you send that design file to the router. The router will then create exact same design you input into the computer. a workspace bed or table. Even the more basic CNC routers are capable of making signs and relief pictures on wood, plastic and metal. Making signs isn’t the most exciting work, but when the machine starts creating the sign, it’s not like you have to stand and watch it. Signs are a mainstay for many businesses using their CNC router. Moving on from the easily accessible ‘sign making’ opportunity, a small business could design and create ornate cabinetry and doors. This would require the right marketing if you’re selling directly to individual customers, but you could also wholesale your service to a kitchen design company or cabinet shop. Also, there are usually many custom furniture makers in every major city who might be willing to partner with a custom CNC business. If you and your shop employees are designers by trade, you could create your own items and sell them direct to customers. You could churn out relief pictures of major attractions in your area that are popular for tourism. Three-dimensional puzzles, boxes, bowls or similar items or make them with special carved features on them are all options for your CNC router… Custom cutting boards are always great sellers. Own a trophy shop? A CNC router would allow you to easily produce completely custom items for your customers… no more of the same template trophies that people get every season. A CNC router can really boost your business, or become your entire business. IEHK offers 7 base models of CNC routers to choose from. All of our routers are built with extremely durable welded steel frames and come directly from the manufacturer with a 2-year limited warranty.